It’s been a long 50 years since Spacewar first burned through CPU cycles on a PDP-11, and there have been a lot of games written and played in those years. There’s a temptation to ask, sometimes, if there was any point to all of it. I mean, when it comes right down to it, computer games have just been another way of wasting the precious few heartbeats any of us get in our lifetimes. 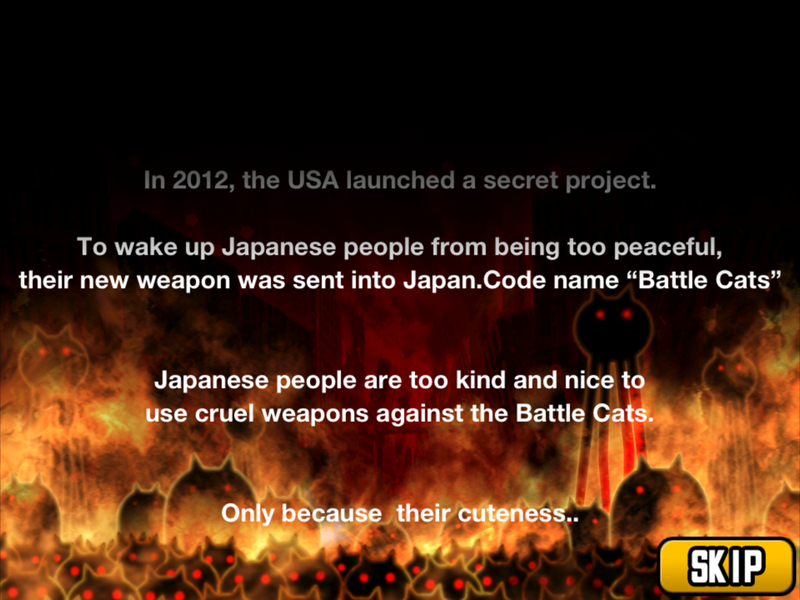 Then I find a game like Battle Cats and I realize that it’s all been worth it. This game – if it is appropriate to call the culmination of 50 years of man’s collective endeavors a game – makes it all seem like it had a deeper meaning, like, like, like I’m writing a blog post at 3 in the morning and having trouble with vocabulary. …which is to say, I don’t think they’re DELIBERATELY being offensive, but again I cannot be sure. Anyway, this is a hell of a weird game. You are in command of a force of cats and cat-like creatures who invade Japan from Nagasaki and move, roughly, east and north, conquering all cities in your way. Each city costs a certain amount of energy to attack, you have a limited store of energy, and your energy takes a while to recharge – though, of course, you can always drop a few bucks to instantly refill your energy. OR, you can play the game for 15 or 20 minute stretches at any given time, generally make consistant progress, and get to the end credits without spending a penny, which is what I did and which I feel a little guilty about. But enough about the game’s theoretical revenue stream. Play is simple enough. You have a tower, the defending city has a tower, you have to attack the opposing tower while it throws out defenders and one or the other of you is going to wind up a pile of rubble. Your units are, of course, adorable for the most part. 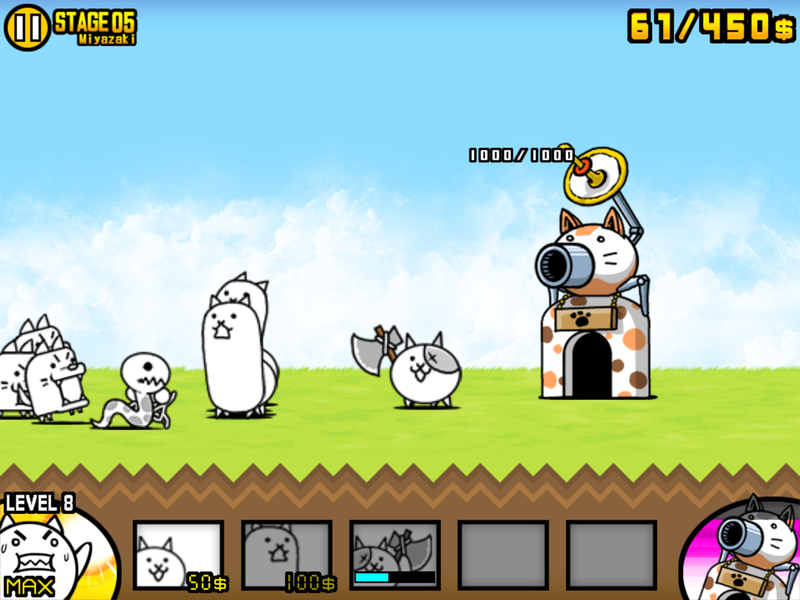 Seriously, it’s a kitty cat with a big axe. Its name is Axe Cat. 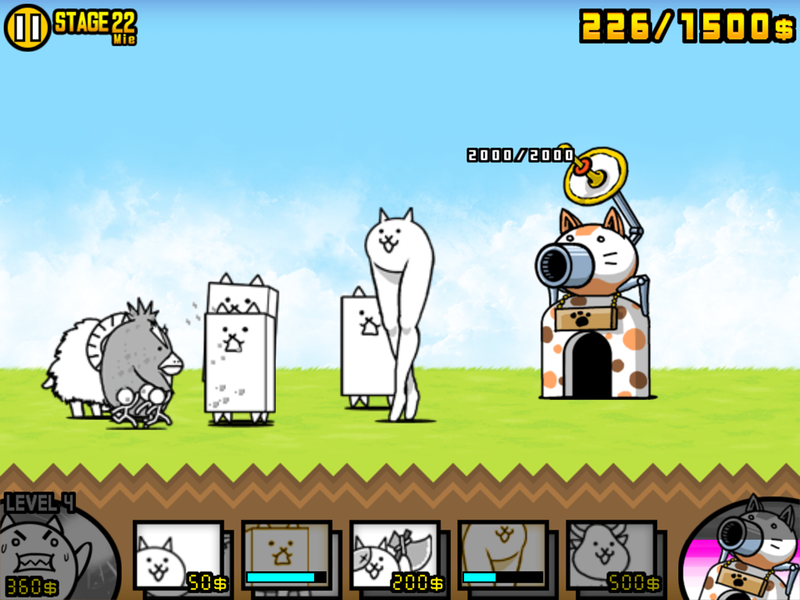 Some of your units are a little less adorable, like these tall “Gross Cats” shown assaulting the enemy base in Okayama. You’ll get a lot more out of this game if you know a little bit about Japanese cities, by the way, because the bases are usually modeled after a local specialty food or – in this case – Momotaro, since Okayama is the home of Momotaro. It’s a pretty deep game . 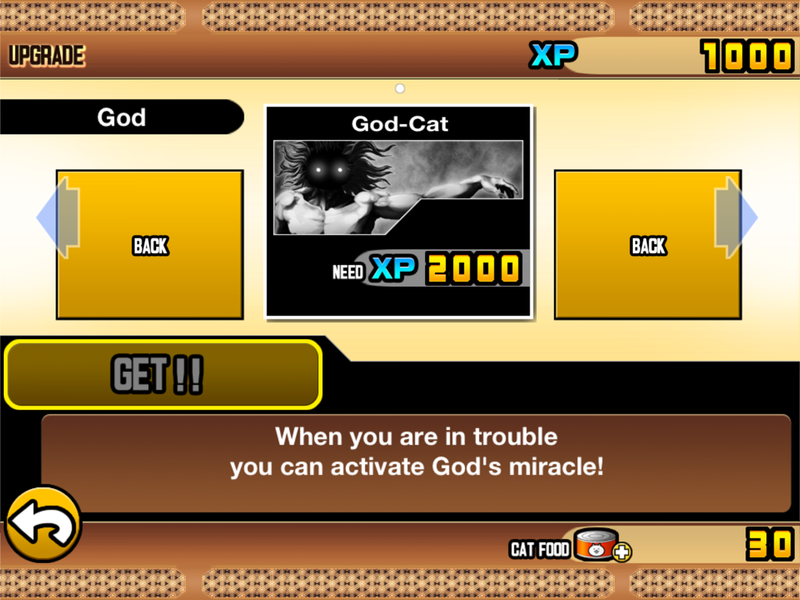 You have nine units that can be purchased and upgraded using XP gained from clearing levels, but you can use the same XP for quite a few other purposes – buying upgrades to your tower, improving your money gain rate, lowering cooldowns on summoning new cats or increasing your energy tank so you can play more at a time, for example. In the early game, when you don’t have a lot of XP, you wind up making a lot of tradeoffs and agonizing over which cats to upgrade first. This represents a pretty common mid-game opening, by the way. 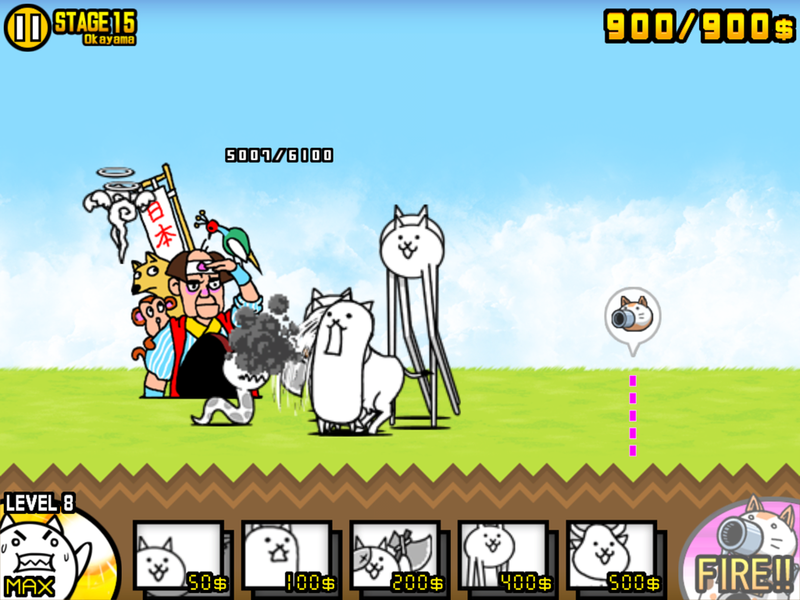 The rectangular cats are very tanky, they take a lot of beating but don’t put out a lot of damage. The long-legged cats cat hang out behind the tanky cats and kick things with relative impunity. This works until about level 40 (of 48) when the game suddenly turns into a damage race, which is quite a shock if you’ve gotten used to turtling up and building up your reserves before venturing forth. Not that I would know anything about that. It uh happened to a friend. A friend who suddenly had to go back and do a lot of grinding in earlier levels. 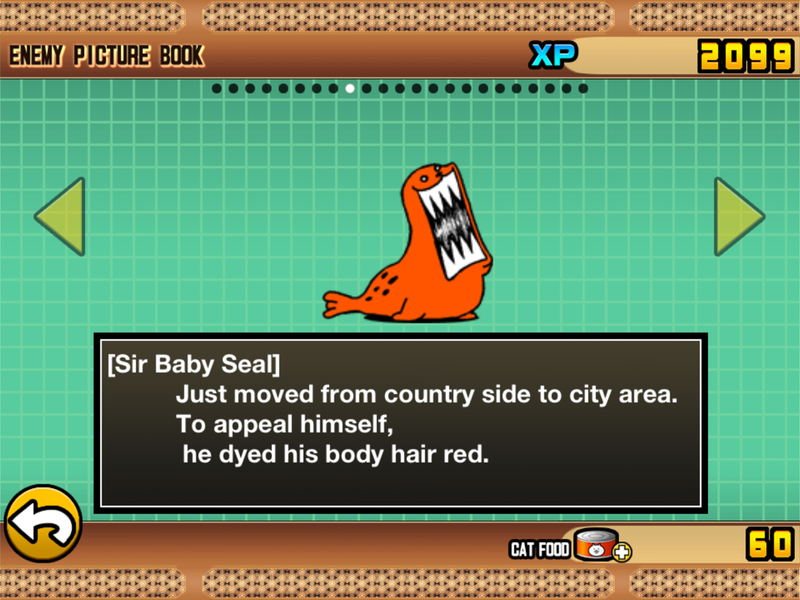 Anyway, it’s bizarre, it’s free, it’s generally adorable and it has killer seals in it. Oh, and it’s even available for Android devices in addition to iOS, so – for once – Android owners aren’t being left out in the cold. Anyway, since this represents the pinnacle of video games for now and for all time, and since the only direction we have to go from here is downhill, you should probably check it out. This entry was posted in iOS, videogames. Bookmark the permalink.